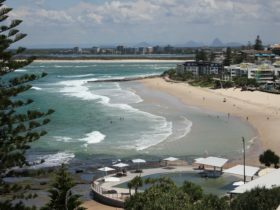 Aspect Caloundra has stunning views of the coast and the Glass House Mountains. They are centrally located in the heart of Caloundra, only 100 metres to the Happy Valley beach and 50 metres to Caloundra’s main shopping precinct. The patrolled Bulcock Beach is only a five minute stroll, while the patrolled Kings Beach is only a 10 minute walk via the beautiful coastal boardwalk. Cafes and Restaurants are in the complex or a couple of minutes walk. You’ll love the Aspect – Aspect Caloundra. 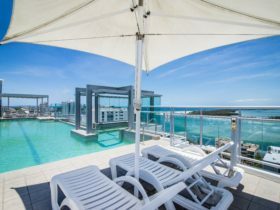 One Bedroom Ocean Apartments are Resort Apartments positioned on the Ocean side of Aspect Caloundra and provide lovely partial Ocean views from the bedroom and balcony. 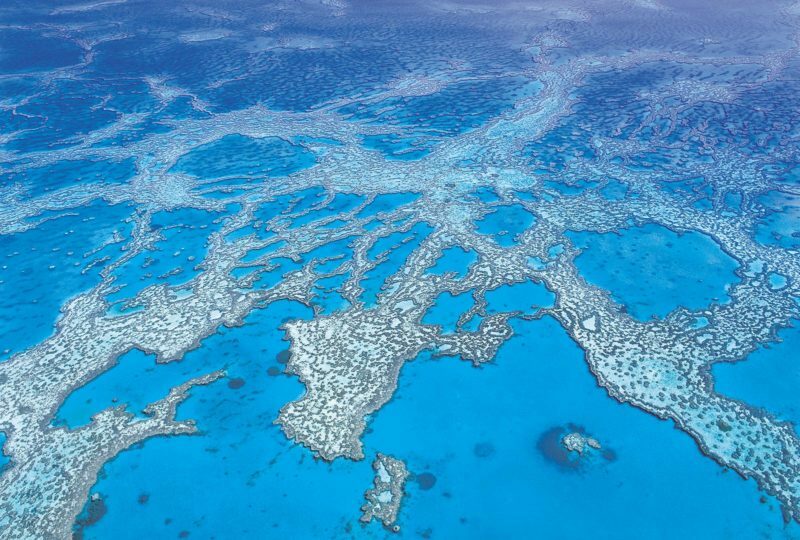 Located on levels two to four, the views also includes glimpses of Bribie Island and The Glass House Mountains. Unwind after exploring the beautiful Sunshine Coast in the comfort of your luxury, air-conditioned and fully self-contained One Bedroom Ocean Apartment. All Apartments are designated as non smoking. In room WiFi and cabled internet available. If you are looking to indulge yourself and enjoy a relaxing holiday, then this one bedroom penthouse will fulfil all your needs. This luxury apartment is located on Level 10 of Tower Two, it provides stunning views of Caloundra’s picturesque coastline and hinterland. As well as a spacious interior, it has a roomy wrap around balcony. Full Foxtel package is a bonus with this apartment, and it also has cable internet. The apartment is designated non smoking. Relax in this spacious ground floor one Bedroom apartment with large secure courtyard. Master Bedroom with queen size bed, has en suite with spa bath and a separate shower. Apartment has a full kitchen, dining and lounge. Private and secure street access. South facing “Ocean” Apartments have partial views of the shipping channel and include glimpses of Bribie Island and the Glass House Mountains. These apartments are all spacious, very well appointed and designed for living. All have air-conditioned master bedrooms and living areas, king bed or queen bed in the master bedroom and two single beds in the second bedroom plus two bathrooms for your convenience. “Ocean” apartments are located on levels two to four. In room WiFi and cabled internet available. Serviced weekly. The best that Aspect has to offer! This superb apartment is located on Level 11 of Tower Two and provides unique and stunning views of Caloundra’s picturesque coastline. With security access into your own private foyer this very large apartment provides you with three bedrooms, three ensuites (spa in master), living and dining room and formal lounge. This is for those that crave style and luxury and can stay a little longer. A minimum stay of five nights applies. The apartment is set up for a maximum of six people with king bed, queen bed and double bed provided for your comfort. Serviced weekly. In room WiFi and cabled internet available. If view is important then select the “Aspect” Apartments. 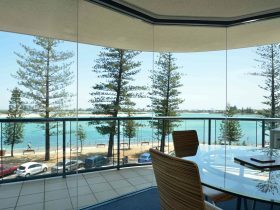 Guaranteed Levels eight to 11 these apartments provide some of the best views available in Caloundra. Your large Southern balcony provides exceptional views of the Shipping Channel, Bribie Island, Pumicestone Passage, Golden Beach and the mystical images of the Glass House Mountains. Your northern balcony has views across the township of Caloundra, Kings Beach, north along the coast to Mooloolaba and west to the Hinterland. Serviced weekly. In room WiFi and cabled internet available. You’ll Love The Aspect – Aspect Caloundra! If views are important to you then the “Aspect” Apartments are just what you are looking for. 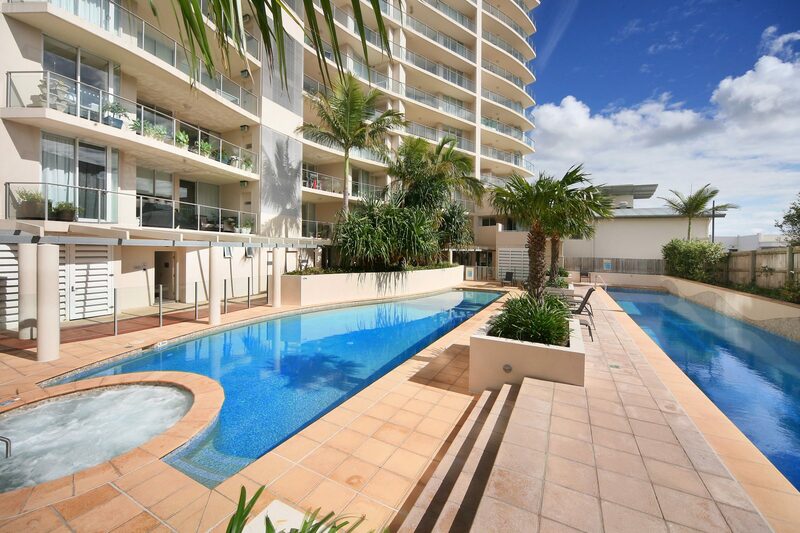 Guaranteed Levels eight to 11 they offer some of the best views available in Caloundra. Your large southern balcony provides exceptional views of the Shipping Channel, Bribie Island, Pumicestone Passage, Golden Beach and the Glass House Mountains. 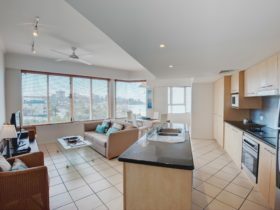 Your northern balcony has views across the township of Caloundra, Kings Beach and north along the coast to Mooloolaba. These very large apartments are designed for long term living and have been set up to sleep a maximum of six people in absolute comfort. King bed, queen bed and two single beds are standard. Serviced weekly. In room WiFi and cabled internet available. You’ll Love The Aspect – Aspect Caloundra! Luxury air-conditioned apartment, spacious, well appointed, ideal Executive’s apartment. One Bedroom Resort Apartments are located on levels one to four. 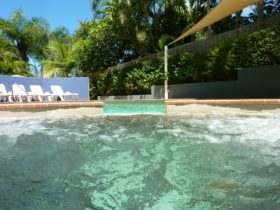 These apartments are great for those that wish to save a few dollars while enjoying the excellent facilities of Aspect Caloundra, heated pools, spa, sauna steam room, full size tennis court, gym, theatre and meeting room. Standard bedding is queen size but many have king size beds. Serviced weekly. In room WiFi and cabled internet available. Premier Apartments are considerably larger than the Resort and Ocean Apartments. Being located on levels two to seven you will get good views including the Shipping Channel, Bribie Island, Pumicestone Passage, Golden Beach and the Glass House Mountains. Very large balconies are a feature of these apartments. Spa baths are located in the ensuite and large living areas provide you with room to unwind and relax. Apartments are serviced weekly. In room WiFi and cabled internet available. The best that Aspect has to offer! This superb apartment is located on Level 11 of Tower One and provides unique and stunning views of Caloundra’s picturesque coastline. With security access into your own private foyer this very large apartment provides you with three bedrooms, three ensuites (spa in master), living, dining room and large balconies. This is for those that crave style and luxury and can stay a little longer. A minimum stay of three nights applies. The apartment is set up for a maximum of six people with three queen beds. Serviced weekly. In room WiFi and cabled internet available. You’ll Love the Aspect – Aspect Caloundra. Premier Apartments are considerably larger than the Resort and Ocean Apartments. Being located on levels two to seven you will get very good views including the Shipping Channel, Bribie Island, Pumicestone Passage, Golden Beach and the Glass House Mountains. Very large balconies are a feature of these apartments. Spa baths are located in the ensuite and living areas are what you would expect to find in a large two or three bedroom apartment. In room WiFi and cabled internet available. The three bedroom Premier apartments offer luxurious living for up to six people with all the comforts of home including a spa bath in the ensuite. Combined with large balconies these huge apartments allow you to escape the stress of modern living. With these apartments located on levels two to seven you will get good views which include the Shipping Channel, Bribie Island, Pumicestone Passage, Golden Beach and the Glass House Mountains. In room WiFi and cabled internet available. Various bedding configurations apply. Serviced weekly. Relax in this spacious ground floor two Bedroom apartment with large secure courtyard. Master Bedroom with queen size bed, has en suite with spa bath, separate shower. Second Bedroom has twin beds (or king). Has private bathroom, full kitchen, dining and lounge.